Lynn joined the team as part-time receptionist in September 2007. She has four cats and three dogs and is interested in motorcycle racing as both her husband and son race. Her love of the job and her sunny disposition are evident as she welcomes you at the front desk ! 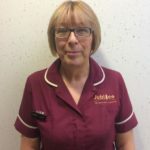 Pauline Davison joined Jubilee Veterinary Centre in 1996. 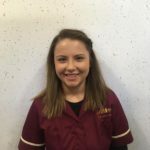 She attended Greenmount Agricultural College were she completed her veterinary nurse training and qualified as a veterinary nurse. Pauline was brought up on a farm in Killinchy, Co Down were she has always been surrounded with various kinds of animals. 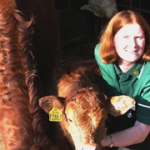 Pauline works in the large animal side of the practice dealing with farm clients,large animal farm calls and all aspects of TB testing. In her spare time she is involved in the running of the family farm. Pauline’s other interests include competing in vintage ploughing matches having formerly ploughed for HRH The Prince of Wales during the world ploughing championships. She also enjoys exhibiting vintage tractors and baking. She is a keen musician playing the piano and enjoys singing. 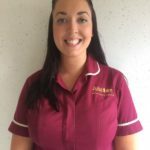 Vicki has been part of the reception team since April 2013, dealing both with the large and small animal side of the practice. She has a background in retail and nursing care. Vicki has a 3 year old mad giant schnauzer called Freckles. 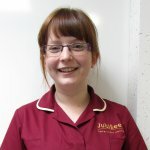 Zoe has been part of the reception team since January 2015. She has been involved in a veterinary environment on a part time basis for ten years. Zoe has a keen interest in show jumping so spends most of her spare time with her two horses and mad springer spaniel, Archie. She also enjoys singing, running and is training toward her next half marathon. Clare joined Jubilee in summer 2017 after studying agriculture at Greenmount College. She is involved in the large animal side of the practice and comes from a farming background in sheep and pigs and has a loveable jack russell called Bruce.